At the race track located at the Wisconsin State Fair, the sixth race of the season in Milwaukee is bearing the fruit that many felt would never happen with the move to unification when it was announced late last February. Of the ten drivers for teams that originally started the 2008 season as ChampCar World Series organizations, half of the ten filled half of the spots available in the first five rows of two during qualifications today. That translates to five of the top ten positions. To put it another way, eleven of the remaining sixteen positions (for a total field of 26 cars) are filled by drivers from established IRL teams. The other real story involves the names of the two drivers who occupy the top two positions. An Andretti and a Rahal, again, are the two names that top the charts of American open wheel racing. This edition of the show features the spawn of champions past. Graham Rahal of Newman/Haas/Lanigan Racing laid down the gauntlet about halfway through the late afternoon qualification session in Milwaukee with an average time of 1:27.1796 with a speed of 167.654. He was only challenged once during the qualifying session. He was challenged once later in the run of his four lap session by Helio Castroneves/Penske Racing who eventually ended up in the third qualifying position just behind Scott Dixon/Target Chip Ganassi Racing before the runs laid down by Marco Andretti/Andretti Green Racing then Will Power/KV Racing Technology. 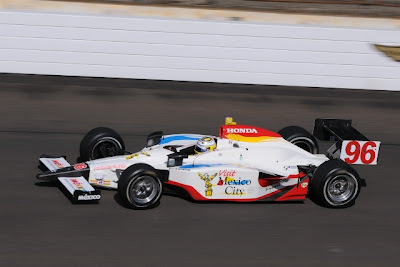 It was Marco Andretti, the second youngest driver in the series to win an IRL race though (the youngest being Graham Rahal). Andretti made the most impressive run. His average time for the four laps was 1:26.9591 for a speed of 168.079. The last driver to qualify, Will Power, was fast enough to drop Castroneves to fifth, who was just ahead of Tony Kanaan with Andretti Green Racing in sixth. "We are learning about the car. It is very difficult to make a lot of progress without much practice time. We just have to be patient, it is not a one-day thing and we will keep improving. For us right now, it is not really about the position we are in, but more about gaining the experience of track time. But, obviously today the car is not where we want it. I am really looking forward to the race tomorrow. It will be great for me and for the team to get back into race mode, strategy and pitstops. Finishing the race is the most important thing right now, so we can get as many laps as possible in changing conditions to learn about the cars behavior." American Open Wheel racing has always captivated the interest of motorsports enthusiasts throughout the world and this weekend hosts a race that has been held for 92 years in the state of Indiana. 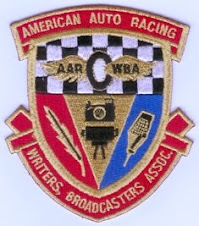 Each year, on the final weekend of May, powerful cars, without fenders, with their wheels sticking out to defend the four corners of the space they occupy, speeding around a large rectangle for 500 miles (200 laps), yellow flag sessions during the race bunch up the field of 33 cars, pit stops throughout for tires and fuel can lead to an advantage or setback given a smooth result or a malfunctioning airwrench, 400,000 spectators line the pavement strip where the cars can fan out three to four cars wide, where, at the end of the race, the winner is treated to a swig from a quart of milk to become one of the names in the world of automobile racing few will forget (more recognizable than annual series champions) … this is the Indianapolis Motor Speedway and the race that defines American motorsports, The INDY 500. This year is the first year since the formation of CART back in 1979 American open wheel racing is unified under one annual competitive series of races that, in the end crowns a champion – one champion, one series, and this one race. At the heart of this series of races is the fourth race of the 18 that will be held here in 2008. Nine drivers of the field of 33 cars in the race are from the former CART/ChampCar World Series and through unification, these nine drivers represent an infusion of new talent to this fabled racing competition. Racing with equipment the teams of the nine drivers received in the merger agreement, some with parts that needed to be upgraded to 2008 specifications, equipment that is new to the learning curve of the chassis engineers and specialists on each team that helped to qualify these nine drivers to a new track beginning on the fifth row. At the wave of the checkered flag, after two warm-up laps performed by the 33 rows of three cars side-by-side, that starts the 92nd INDY 500, the “Fine Nine” are placed in the field in the following order. Julianne Hough sings the National Anthem at 9:55 AM PDT and four jets fly-over the yard of bricks. It’s time for the drivers to get into the cars and show a moment of silence for those who have died so that we may remain free on this Memorial Day (TAPS). Back Home Again In Indianana, as sung by Jim Nabors – “Oh how I long for my Indiana home”. Good luck to Helio Castroneves on his attempt to win the INDY 500 three times; Is this the race that Danica Patrick breaks through and has a woman win the 500 mile race … or will it be Sarah Fischer, or Milka Duno? Orrrrr, will it be one of eleven rookies with the overwhelming number of them coming from the ranks of the former ChampCar World Series? Clear!, still clear! – off to a great and clean start. YELLOW Flag flies for debris on the racing line on the track – LAP 8. Bruno Junqueira’s Dale Coyne Racing Dallara looses a mirror at speed and he will have to come in and have it replaced. He had moved up in the order before the incident to Position # 13 and was the lead driver in the “Fine Nine” at the time of the incident. Sarah Fischer spins while on scrubbing off her tires in the corner while waiting for the field to go back to Green on LAP 13. LAP 18 re-start and Buddy Rice followed by Justin Wilson of NHL take the Checkered Flag. LAP 20 sees Dan Weldon taking over the overall lead with Justin Wilson passing Buddy Rice for 3rd. At 25 laps the Fine Nine are struggling to maintain pace … after Wilson at Position #3 we see the next Fine Nine driver at Position #20 being EJ Viso, #23 Will Power, #23 Mario Moraes, #24Rahal, #26Bernoldi, #27 Camara, and 17 laps down after having the mirror replaced, #33 Junqueira. Pit Stops and Buddy Rice gains a position on Justin Wilson. YELLOW Flag – Graham Rahal of Newman/Haas/Lanigan hits the wall on LAP 37 while avoiding a car driven by Alex Lloyd that had slowed down to enter the pits. One Fine Nine driver OUT and one down 17 laps with Bruno Junqueira. Buddy Rice and Justin Wilson stay out while the rest of the field comes into the pits for tires and fuel. Danica Patrick has a long time in the pits. FIRE in AJ Foyt IV’s car while in the pits on LAP 39 … the second fuel incident for Foyt IV in the past full week. After all of the incidents, the shuffle has the “Fine Nine” in NO fine positions at all … its dismal. The highest position any T-Team driver occupies at the restart on LAP 46 is Will Power of KV Racing Technology at Position #16. LAP 60 – Marty Roth hits the wall in his Lids sponsored car in a similar accident that befell Graham Rahal. Car slowing into the pits and catching the trailing car off guard and by the time the driver reacts, he is in the marbles and into the wall. Helio Castroneves hits some of the debris and crunches a front wing. Crash and YELLOW Flag for Jamie Camara on LAP 81 as Jamie gets too high into turn one, hits the wall and slides the length of the short chute and smashes into the wall at turn two before sliding to a stop. OUT, Jaime Camara Conquest Racing, No Sponsor. Pits open and Danica Patrick picks up two more spots to position #9. 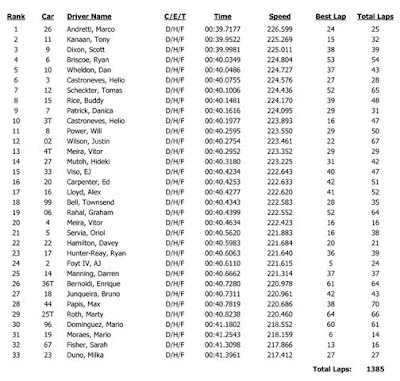 Re-Start GREEN Flag on LAP 92 and EJ Viso climbs to #11, with Servia, Wilson, and Power at #15, #16, #18 respectively. Tony Kanaan splits the Target Chip Ganassi Team cars driven by Scott Dixon and Dan Weldon then passes Weldon for the lead on LAP 96. Marty Reid, the announcer suggests that approaching the half-way point is beginning to see a page turn as it relates to tactics. Andretti Green Racing team members are making a move as Marco Andretti climbs into the top five at 100 laps. YELLOW Flag on LAP 105 - Tont Kanaan, and Sara Fischer collect each other after Marco Andretti cuts into Tony’s line in the corner forcing TK into the marbles and the wall. Team owner and Tony Kanaan are not very happy. Everyone pits on LAP 107 – Servia passes Viso in the pits to take position #11 before the restart. LAP 112 - Something breaks on Jeff Simmons AJ Foyt Racing, ABC car and has him first hit the outside wall then the inside wall on the front straightaway. GREEN Flag Restart LAP 117 – Scott Dixon, Marco Andretti, Dan Weldon, Tomas Schecter, and Ed Carpenter in the lead. The next two laps sees a mix of aggressive driving by all cars in the top 15. Danica Patrick warned about blocking Helio Castroneves. Marco Andretti passes for the lead with 79 laps to go. LAP 128 has Ryan Hunter-Reay pass Dan Weldon for position #6. Biggest mover up the field is Oriol Servia up to position #10. Justin Wilson into the wall with 67 laps to go … there will be no finish or win for the Newman/Haas/Lanigan team for the 92nd running of the INDY 500. Pit Stops for all. Ed Carpenter suffers gearbox problem in the pits and looses a lot of time and is the last car on the lead lap - 23. Mario Moraes Dale Coyne Racing does not pit and assumes the lead of the race … mark a moral victory to the T-Team Fine Nine proud! Helio Castroneves moves up three spots to #7. 61 LAPS to go and Scott Dixon moves from third to first with Mario Moraes is a sitting duck. Moraes just misses the wall in the short chute between turns one and two. Mario Moraes is loose, slow and needs to pit – DUAH! Yellow Flag LAP 148 – Alex Lloyd crashes while holding position 17 from turn 4 into the entrance of the pit lane, taking out the speed radar sensors that help race management regulate the speed in pit lane. Pit Lane open on LAP 154 – Dan Weldon has trouble in the pits and gets bumped to the back of the field. Tomas Scheckter climbs out of his car … his race is over due to a broken half-shaft . GREEN flag on LAP 159 – Vitor Miera Panther Racing Delphi/National Guard takes the lead. LAP 166 sees Vitor Miera leading, Scott Dixon Target Chip Ganassi, Helio Castroneves Team Penske, Marco Andretti Andretti Green Racing, and Ryan Hunter-Reay Rahal Letterman Racing in the top five. YELLOW Flag, Eighth caution of the race. LAP 167 has Milka Duno spinning through the short chute and into the grass out of turn 4. Final pitstops has contact between Ryan Briscoe and Danica Patrick knocking out both cars. Ryan Briscoe of Penske Racing slides into Danica as he comes out of the pits. LAP 174 has Scott Dixon takes the Checkered Flag and the traffic into turn 1 is like driving in downtown Boston at rush hour except that instead an inch a minute drag race in your rental car against a taxi cab, these guys are running at INDY speed. On the backstretch Dan Weldon gets into the grass on a little off-roading excursion and solders on at speed. LAP 181 – Everyone is good on fuel … this is a sprint to the finish. Scott Dixon looks to be in charge with Vitor Miera, Helio Castroneves, Marco Andretti, and Ed Carpenter in tow. The top five positions are within about one second of each other. Ten laps to go and Marco Andretti is on the march and moves to third place. Marco has the fastest car in on the track with eight laps to go. Marco can see the race leader and he is “flat-footing” it all the way. With five laps to go Marco is only two car lengths away … Vitor begins to pull away from Marco and is close enough to get a tow from Dixon. Three laps to go and Dixon begins to pull away and begins to encounter traffic … and clears. Two turns to go and there is nothing but track – Dixon brings it home to win the 92nd INDY 500 and the 2.5 Million Dollar purse. The 19th driver to win from the pole position. Congratulations to Vitor Miera and Marco Andretti for their podium finishes. A one-time race for the ages, a first for unification in the modern era after only 29 years. Dixon became the first native of New Zealand to win theIndianapolis 500. After starting from the pole position, he led seven times for a race-high 115 laps and beat Panther Racing's Vitor Meira to the finish line by 1.7498 seconds. The race featured 18 lead changes among nine drivers. 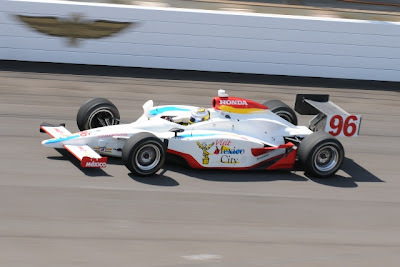 The previous record winner's purse was $1,761,740 awarded to Buddy Rice in 2004, while the 2007 Indianapolis 500 field was awarded the previous record race purse, $10,668,815. The event purse is comprised of Indianapolis Motor Speedway and Indy Racing League awards, including the new IndyCar TEAM (Team Enhancement and Allocation Matrix) program, sponsor awards and other designated awards. Meira's efforts in the No. 4 Delphi National Guard Dallara/Honda/Firestone earned $1,273,215, the first time anyone other than the Indianapolis winner has won more than $1 million, far exceeding the previous second-place record payout of $739,665 for Helio Castroneves in 2003. This video was put together by Derek A. Platts, Associate Producer, ESPN - International Production from the events that transpired on Bump Day. Derek was able to borrow a Pacific Coast Motorsports team scanner which was able to tune into the audio insights and the drama that IS … Bump Day. Pacific Coast Motorsports and the Mexico City Tourism Board announced today that they have entered into an agreement with KV Racing Technology for Indy 500. Oriol Servia, driver of the #5 Angie’s List Special will carry the Visit Mexico City logo at the 92nd running of the Indianapolis 500. 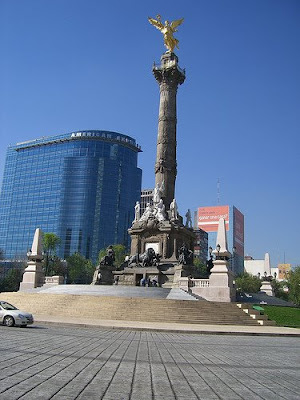 Pacific Coast Motorsports and the Mexico City Tourism Board announced their program just one month ago. The rookie team and driver missed the 33rd starting spot in final qualifying last Sunday after a remarkable performance, which placed Dominguez “on the bubble” Sunday afternoon. 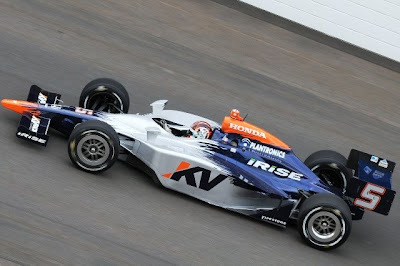 Oriol Servia will make his first Indy 500 start from the inside of row nine, in the 25th starting position on Sunday. "This is not just a [sponsorship] project of this team any more," Dominguez said. "This is the project of a country." Mexico City is installing more than 90 Jumbotron television screens at sporting venues and parks around the city just for the race. 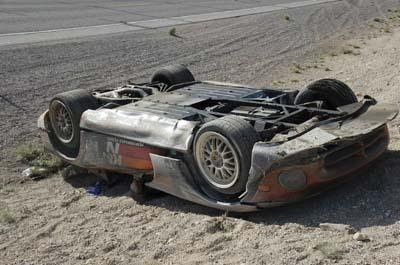 The 2008 running of the Nevada Open Road Challenge did not go as smoothly as most people would have hoped ... for an open road rally event held in two locations, that has been staged by the same event organizers (sometimes as many times as three times a year) for 21 years. The problem with this last weekend’s event wasn’t so much a problem that a Dodge Viper managed to leave the open road and flip over about half way through its run, NO, the problem was mainly that the Nevada Department of Transportation decided that they would take control of the event from the event organizers and sponsors that had overseen the management of this open road rally event since its inception back in 1988. 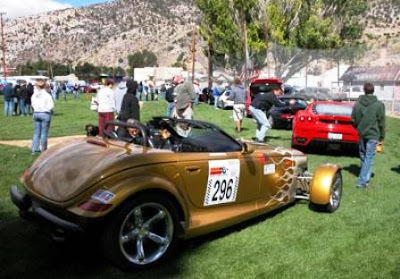 The Nevada Open Road Challenge in May and the Silver State Classic Challenge held in September, is a car rally event held on a 90 mile stretch of a little traveled open road from North near Lund to South near Hiko on Nevada Highway 318. In previous years, the rally organizers would work with individual police and highway agencies and the state of Nevada so that the roads along the rally route would be properly shut down and signed and patrolled for the safety of the racers and other people in the area. For twenty years, everything went off without a hitch. This year’s event, however, had problems due to the lack of communication and understanding by the Nevada Department of Transportation which over-reached and assumed responsibility for the management of the rally. The hope is to have an error free event. This hope turned out to be wishful thinking … and the problems began early after a fifty-six minute delay created by the NDOT. It was soon followed by a flip-over crash of the Dodge Viper driven by Jerry Moll, of K&N Engineering, Inc., a sponsor of the event. Only nineteen cars of the 143 cars wanting to rally on the open road were able to start before the NDOT took assumptive control of the race course and the time management of the rally. Backers of the Nevada Open Road Challenge are blaming the Nevada Department of Transportation for more than five hours of race delays Sunday and the cancellation of parts of the 21st running of the race, resulting in 41 drivers never leaving the starting line. 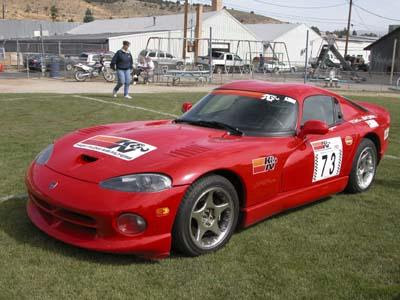 Several drivers said they spent thousands of dollars bringing cars and crews to Ely from other parts of the United States and one crew and car that did not race came from Europe to compete in the Silver State Classic Challenge-sanctioned speed event that runs about 90 miles along Nevada 318 from a starting line south of Lund to Hiko. The SSCC and others are saying that NDOT officials made decisions about delaying the race after a crash and the continuation of the race was in jeopardy. NDOT's role was to close the highway and keep it closed until the race was completed. “I got there yesterday afternoon and I was pretty shocked at what a fiasco it was,” Ed Spear, White Pine County Tourism Director, said Monday. “It appears from what I have seen that NDOT made the errors.” Spear said. Those errors included a failure by NDOT to post signs in the Alamo area alerting motorists of the Highway 318 road closure. That caused a 56-minute delay in starting the race. He also chided NDOT for mistakes that led to a four and a half hour delay following a crash and not allowing the race to be completed. Spear said NDOT's mistakes in handling the event delayed portions of the race, and reflected badly on Ely and White Pine County. Those mistakes have a negative impact on tourism in White Pine, Lincoln and Nye counties and the state. “The Nevada Department of Transportation needs to issue the permit and let the promoter run the race,” Spear said. He took it a step further. “I believe, from day one, the NDOT has not liked this race.” Spear said. “The racers know there is an inherent risk in racing,” Spear said, adding that the SSCC does an incredible job with safety. He said both sides should discuss the issues. Spear said if it becomes necessary, legislation could resolve future problems with NDOT related to the race. About 40 miles from the starting line south of Lund, SSCC President Steve Waldman saw smoke in the distance. “I realized it was Jerry Moll. I could not stop. I was not allowed to stop. We immediately red flagged the event.” said Steve Waldman, President of the non-profit Silver State Classis Challenge. Kathleen Weaver, NDOT's assistant district engineer in the Ely Office and Randy Hesterly of NDOT in Elko, were in charge for the NDOT at the event. The race organizer said the NDOT representatives didn't like the response to the crash by race personnel. “They told the race director they were going to stop the race,” Waldman said. “They could have discussed it with me” but did not. He said NDOT claimed race communications were not running well. That is a claim Waldman said was not true. The delay following the crash lasted just over four and one-half hours. “They held up over 500 people from 9:39 (a.m.) until 2:10 in the afternoon when the event resumed.” he said. The race resumed with starts for less than a half hour. Then NDOT stopped any further drivers from starting the race to complete it by the 4 p.m., the road closure time limit. NDOT did not agree to any additional road closure time. “NDOT never, never communicated with us,” Waldman said. “Forty-one cars did not start. People who came from Texas, people who came from Norway, Pennsylvania and on and on did not start the event,” Waldman said. “It cost us thousands of dollars extra,” he said of costs for hourly employees and to keep ambulances stationed along the race course. We don't want incidents. If the car breaks down that's fine. If the car flips that's fine. We are interested in the person inside the car,” Waldman said of safety taking a high priority. Weaver (NDOT's assistant district engineer in the Ely Office) did not return two telephone calls from the Ely Times on Monday. To be honest, what happened on Nevada Highway 318, Sunday, May 18, 2008 would be as ridiculous as the state of Indiana Department of Transportation managing the track at Indianapolis Motor Speedway during the Indy 500 come May 25, 2008. There is a HUGE difference in focus and background understanding between transportation/road engineers and motorsports competition event specialists. We, at The EDJE, talked with Steve Waldman before posting this review of the events of last weekend, and he insists, the Nevada Department of Transportation is there to observe that Highway 318 has been prepared according to the agreements with the state, issue the permit, then let the race organizers with the 500 participants, course workers, and safety personal aided with a communications network, ambulances, and aircraft run the event. In the twenty previous years the event has been held, everything operated perfectly, primarily because the NDOT recognized their role. Issue the permit to the race organizers because all of the road qualifications had been met, get into proper position (preferably, next to the race organizer), then get the "H-E-Double-Toothpicks" out of the way, stay OFF of the road, and let the people who spent their hard earned tourist money (about 50 million dollars estimated over the years) to come and rally on the open road, RALLY! Monaco is one of the greatest Formula 1 races of the year. It is an iconic example of taking the most sophisticated motorsports equipment designed by man and racing it on a road street circuit through an environment people live in. When one watches a driver do a flying lap in Monaco, one knows that they earn their salary for the year, right there. As far as the value of an event for spectators, one is confronted with the great atmosphere of being in Monaco. You know, the glitz of it all. The glamour of it all. Combine that with Formula 1 racing and one expects an enthusiasm, a passion, that one would probably not get at any other circuit and event in the world today. This released video from the Panasonic Toyota Racing Team includes an edited video piece about the Monaco Grand Prix, with soundbites from Team Manager Richard Cregan, Chief Engineer Race and Test Dieter Gass, Senior General Manager Chassis Pascal Vasselon, and Head of Aerodynamics Mark Gillan. For nearly 80 years, the Monaco Grand Prix has challenged drivers to tame the tight and twisty streets of the Principality. 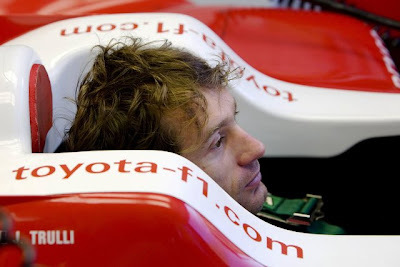 The Panasonic Toyota Racing Team can benefit from driver Jarno Trulli’s experience to face the mental and mechanical challenges the race track features, having won his first Grand Prix in Monaco in 2004. Drivers will need to pay particular attention to the tight curves and the close proximity of the walls next to the track to preserve their racecars' gearboxes, brakes and engines. To say the least, watching the developments of the drivers and teams that were able to transition (T-Team) to the Indy Racing League (IRL) and compete for the championship of the IndyCar Sreies (ICS) has been an exercise in hope spiced with a healthy dose of frustration. To the fan who favored the former ChampCar Series and its history legacy to CART and the spirit of competition this form of racing and equipment provided through the years, the process has had its moments. When the announcement for the merger was first announced back on February 21, 2008, the obvious hope for fans and teams alike was that all of the teams and drivers would just port over and plug-in to the IndyCar Series and all racing life would go on for the duration of the 2008 season. As the reality set in after about thirty days, ChampCar was lucky to end up with as many drivers and teams that have now ended up at the Indianapolis Motor Speedway to compete in the world’s largest staged racing spectacle. Before the merge announcement of unification of ChampCar and IndyCar, the ChampCar Series was about to field 12 teams supporting the talents of 20 drivers in an 18 race event season. 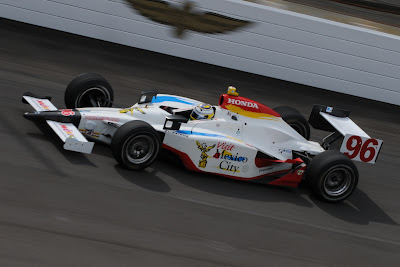 What remains going into the fourth race of the season, the Indianapolis 500 set to be held on May 25, 2008, are 6 teams supporting the talents of 10 drivers with one team and driver making this race its first of the 2008 ICS season (Pacific Coast Motorsports and Mario Dominguez). Leading up to the month of May has been a series of set backs and break throughs. Set backs included a slow transition of teams announcing their participation, a parts shortage on the aerodynamics packages for the Dallara chassis delivered to the T-Teams as reported by Graham Rahal and the Newman/Haas/Lanigan Racing team during the run-up to the first race of the season at Homestead. Writer Robin Miller later confirmed that this parts shortage would effect the T-Teams only. 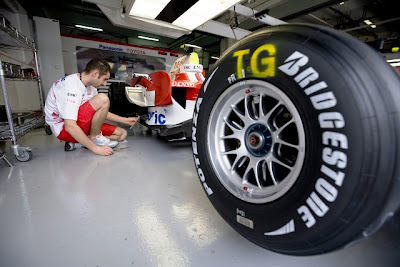 Many experts predicted that the T-Teams and drivers will be at such a disadvantage this 2008 season that no team or driver could expect to win (let alone place, or show) a race until about the sixth to tenth race of the season at the earliest. On the second race of the season, the very same Graham Rahal who could not field a car due to the availability of parts at Homestead, came back and won the race through the streets of Saint Petersburg. The race was hampered by rain, but this did not dampen the spirits of the ChampCar loyal having a breakthrough this soon into the season. 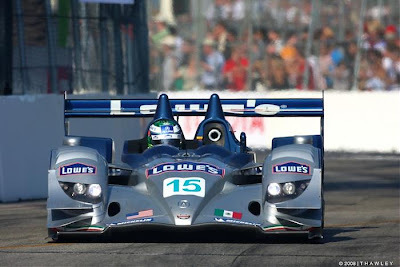 The third round featured the last time the ChampCar teams would be racing exclusively together at Long Beach. Due to scheduling and the quickness of the merger agreement, the IndyCar established teams would race at Twin Ring Motegi, Japan (Honda’s, the IndyCar Series engine supplier, home track) while the ChampCar teams raced in their equipment, the Panoz DP01, for IndyCar points. Highlights include being able to see Paul Tracy, Jimmy Vasser, Alex Figge, Frank Montagny, Roberto Moreno, Nelson Philippe, and Alex Tagliani (to mention a few drivers) turn laps in an American Open Wheel racing environment for the last time in the 2008 season. Winners included, the LBGP fans, Will Power (1st Place), Frank Montagny (one and only ChampCar race and placed 2nd), Mario Dominguez (3rd Place) … and probably the biggest winner of all, Pacific Coast Motorsports. The only professional open wheel racing team located on the West coast was able to take a third place win by Mario Dominguez and put together a two year sponsorship deal with the “Visit Mexico City” tourism bureau and show up at Indianapolis for the month of May. Further, Mario was able to keep the points he earned with his third place finish at Long Beach and apply them to the rest of the ICS season. The two weeks leading up to qualifications at Indy also has its moments for the T-Team Ten. The fastest lap times from this group were fairly competitive, however, these are only one-lap lap times and qualifying requires four consecutive laps. Justin Wilson (224.123), Graham Rahal (224.033), Will Power (223.550), Oriol Servia (223.440), EJ Viso (222.643), Bruno Junqueira (222.390), Mario Moraes (221.475), Enrique Bernoldi (220.645). Graham Rahal brushed the wall a couple of times while drifting up out of the corners, Viso and Power had crashes but all three were able to repair and field their cars in the show. Mario Dominguez and the Pacific Coast Motorsports team were assigned the garage spaces between 14-time Indy 500 race winner Penske Racing and Ganassi Racing, which owns the top two spots on the grid after the opening qualifying session last weekend. Team owner, Tyler Tadevic’s reaction to this fortunate garage draw, "We're the meat in an ‘oh-(expletive)’ sandwich." Mario has suffered from a lack of speed and two crashes into a wall. The first crash came earlier in the week as he was exiting the pits … cold tires spun his car out and he hit the inside wall at low speed. The second crash happened just before the qualifying session today in warm-up practice. Since Pacific Coast Motorsports does not have a back-up car, a position most of the T-Teams are in being first time players in this series, they are hoping to be able to put the chassis back together and get it into the show. With only one spot open at the writing of this sentence and the team reporting that they have all of the parts they need, hope springs eternal. Marty Roth, who's best finish at Indy was 26th and best start, 29th, lines up with his Black, un-sponsored car, at just a couple of minutes left in the session, and goes out and puts together four laps at 215.506 as the slowest car in the closed 33 car field. The weather is forecast to be spotty with rain and drizzle. If the weather bypasses the track, "Bump Day" will be just that for tomorrow, Sunday. The drivers left wanting to make it into the field include Mario Dominguez and PCM ... still insisting that the car will be put back together and if the weather holds off, they can make it into the show. The fastest speed Mario Dominguez was able to achieve in practice - 220.597. 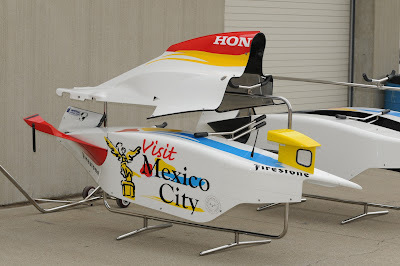 Mario said in an interview in the PCM garage that the Angel that is part of the logo of his "Visit Mexico City" sponsored car is the Angel of Independence, and that this Angel will get them back out on the track and qualify for the 92nd Indy 500. Mario will have to duke it out with AJ Foyt IV (220.972), Tony George's Vision Racing, Eli Lily, and "Mad" Max Papis (221.358), Rubicon Racing, LifeLock. Max Papis crashed earlier today and was able to make a deal with Dreyer Reinbold Racing for Milka Duno’s 2007 car but the car needed to have modifications to the tub in order to have the car make it through technical inspection tomorrow … Team owner and Indy legend, Sam Schmidt has dubbed the car “Frankenstein”. Dominguez is so popular in his homeland that Mexico City is installing more than 90 Jumbotron television screens at sporting venues and parks around the city just for the race. "This is not just a project of this team any more," Dominguez said. "This is the project of a country." A final report has a potential of Jaques Lazier making a deal to field another teams back-up car ... it is said that anything can happen at Indy, and it usually does. No pressure. Yesterday, all of the cars that are to compete in this weekend's Larry H. Miller Dealerships Utah Grand Prix presented by The Grand and Little America Hotels (this event name really needs a couple of more words – d’ya think?) unloaded from their transports and prepared three days of intensive competition. 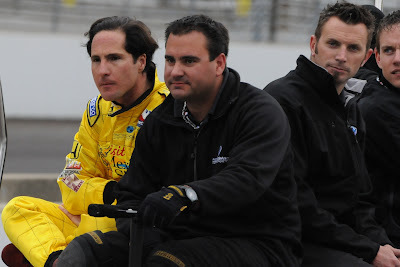 Among the combatants is a recognizable name, but one that hasn’t raced in about five years – Gil de Ferran. If rumors are to be believed, in the rush to become a team owner/driver in the American Le Mans Series and debut here at the Utah Grand Prix with teammate and transitioning ChampCar World Series driver, Simon Pagenaud, Gil forgot to apply for his racing “driver’s license” which would sanction him to compete. He was issued the license just yesterday. 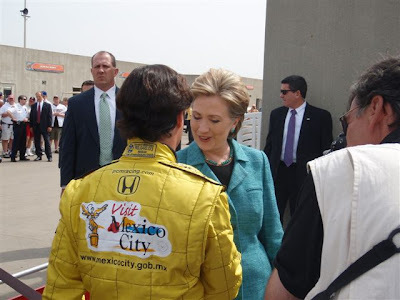 We could see him (Gil de Ferran) unloading the transporter in the paddock at Miller Motosports Park now … Ok, teammate? 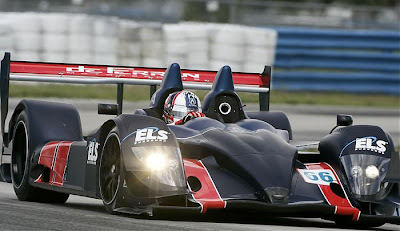 CHECK!, LMP2 Accura? CHECK!, Tools? CHECK!, Tires? CHECK!, Keys? CHECK!, Wallet? CHECK!, License? D’oh! (ala, Homer Simpson). 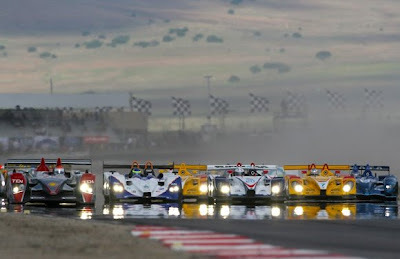 Today, the mountains around Salt Lake City will echo with the sounds of ALMS engines as the cars practice, to qualify Saturday for a starting position, and race on Sunday in the third race of the season and the first race on a dedicated race course. After two thrilling races in the streets of St. Petersburg and Long Beach, the American Le Mans Series heads back to a natural terrain road course this weekend at Miller Motorsports Park. The Larry H. Miller Dealerships Utah Grand Prix presented by the Grand and Little America Hotels is shaping up to provide a new set of challenges to teams and drivers, as the outer course layout of the facility will be used for the first time. The 3.048-mile, 15-turn perimeter circuit replaces the 4.5-mile, 24-turn layout that was used in the first two ALMS races at Miller. It eliminates the tight and twisty bits starting at the Turn 7 complex (Demon, Devil and Diablo), and cuts straight through to Turn 16 (First Attitude). A number of teams have run laps on the new layout, including all four Acuras, as well as Penske Racing and B-K Motorsports. And some drivers believe the new layout could make it the fastest track on the Series' calendar. "For sure, it's very, very fast," Lowe's Fernandez Racing driver/co-owner Adrian Fernandez said of the Utah circuit. "There really aren't that many corners but they are very high-speed. There are lots of fourth, fifth and sixth-gear corners. The G loads that we produce around there are significant. They are even higher than Road America. I think it will be one of the tracks that will be a favorite of both drivers and fans because they like the speed." de Ferran Motorsports’ Panasonic-sponsored assault on the LMP2 class of the American Le Mans Series kicks off this weekend when former Indy 500 winner and two-time CART Champion Gil de Ferran joins forces with young French star Simon Pagenaud for the team’s debut at Miller Motorsports Park aboard their Acura Acura ARX-01b. “Everyone has put in a lot of hours in creating this team and it is great for all involved to see the fruits of our labors become a reality. We have already completed a test at Miller Motorsports Park and we are as prepared as we could have hoped for, considering the short life span of the team. “For me, the weekend will be very emotionally charged but after five years out of the seat, it has been a bit like putting on an old comfortable pair of shoes – in a way this will be an exercise in trying to pretend that the last five years didn’t happen. “I am really looking forward for my first race with the de Ferran Motorsport and Acura. I am amazed that we are about to go racing and six weeks ago I saw the workshop with nothing inside. The Larry H. Miller Dealerships Utah Grand Prix presented by The Grand and Little America Hotels is set for Sunday, May 18 from Miller Motorsports Park in Tooele, Utah. The green flag is scheduled for 1 p.m. MT with live television coverage on SPEED. Live radio coverage will be available on XM Satellite Radio Channel 144 and American Le Mans Radio at americanlemans.com, which also will feature IMSA’s Live Timing & Scoring. 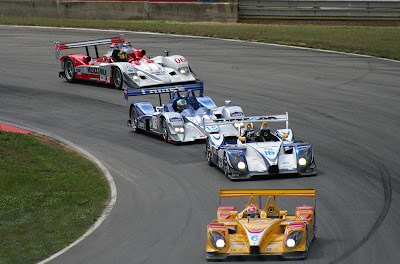 At the end of the day’s practice, “rookie” team owner and new driver to the American Le Mans Series, Gil de Ferran, out paced all drivers on the track. Gil not only was the best in practice on the day, he was the best by nearly a half a second and .62mph ... a grand debut from a team that is barely two months old. This mark can not be all that surprising from the driver that holds the all time speed recorded during a qualifying session. October 28, 2000: Gil de Ferran, during a closed track session, set the record first established by Mauricio Gugelmin with a blazing speed of 241.428 mph. 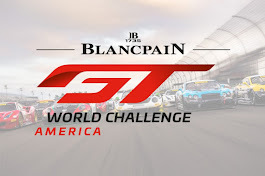 With the American Le Mans Series running in Utah this weekend, one wonders ... why doesn't the management of the American Le Mans Series plan to take in the Nevada Open Road Challenge along the way as a “Qualification” round? If there ever was an event designed to take into account the uniqueness of the full-bodied racing automobiles of the American Le Mans Series classification of cars, it is this open road challenge timed racing event that is held two times a year through Central-East Nevada. Technically, the Nevada Open Road Challenge (May 15-18, 2008)/Silver State Classic Challenge (September 18-21, 2008) event is a rally format that includes a navigator along with the driver held on a 90 mile open stretch of Nevada Highway 318 between the towns of Lund and Hiko. The cars are run in classes at five mile per hour increments, from 95 mph to 180 mph, with the class determined by the vehicle's safety equipment, the driver's experience level and the driver/navigator comfort level. There is also an Unlimited Division for very experienced drivers with full race-equipped cars. Vehicles are started at one minute intervals and 30 second intervals, beginning with the 150 mph class and working back to the 95 mph class. Once the last 95 mph class vehicle clears the course, the Unlimited Division and the higher speed brackets over 150 are run as the final group. This is where the ALMS could make an impact in the annuals of American racing (assuming that the organizers accomidate the ALMS with a basic rules change - driver only) ... have the ALMS cars line up and qualify for the upcoming race in Salt Lake City at the Larry H. Miller Dealerships Utah Grand Prix by driving the 90 miles from Lund, Nevada to Hiko, Nevada, and may the best time win its bracket. With a little planning, this idea would create some history and possibly capture a Guinness Book world record along the way. The State of Nevada closes down 90 miles of Route 318 and more than 200 drivers from around the world converge on the little town of Ely in the central high desert of Nevada. Why do they come? To experience first-hand the adrenaline rush of driving flat-out on a public highway. Not just professional racers, but men and women from all walks of life, pursuing the Walter Mitty dream of speed, horsepower, and high performance. Yes, there’s a place for everyone in the Silver State Classic Challenge events. 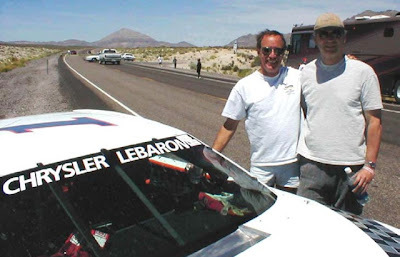 As the Silver State Classic Challenge Series of Open Road Rally Events continues into the new millennium, we thought it might be interesting to trace the history of this unique American auto rally event. It began simply enough in 1988, as a showcase for vintage racing cars. Along with Ferrel Hansen, then President of the White Pine County Chamber of Commerce, the organizers received approval from the State of Nevada to close the highway based on the event’s potential for pumping money into the local economy. That left less than two months to organize the event, which meant getting the go-ahead from all three counties, formulating a traffic control plan, lining up the Nevada Highway Patrol to secure the highway, and arranging liability insurance of one million dollars. After Steve Waldman, one of the original organizers and then Marketing Director of the Showboat Hotel in Las Vegas, agreed to make the Showboat the official host property, everything was in place. When the Silver State Classic Challenge debuted on Sunday, September 25, 1988, it was the first legal open-road rally of its kind in the U.S. in a half-century. In addition to vintage autos, it pulled in a mixed bag of late model, high performance vehicles and muscle cars. Among the 50 odd entries were six Ferraris, thirteen Porsches and four Corvettes. The oldest American car was a ’56 Dodge D500, which blew its engine after just twenty minutes into the event. Overall, three cars failed to finish, but fortunately nobody was injured. For the record, a red 1988 Ferrari Testarossa, driven by Jim Liautad, Jr. of Elgin, Illinois, which averaged 162.58 mph, clocked the fastest time. Thanks to favorable press in nationally known publications like “Motor Trend” and “Autoweek”, the next event drew over one hundred competitors, including a 19-year old phenomenon name R.J. Gottlieb blasted through the course at 197.99 mph, hitting speed in excess of 220mph, a record that has only recently been broken. However, it was later determined that the course was 2 miles shorter than originally thought. 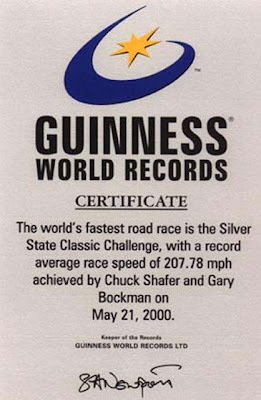 Therefore, the old record was retired and a new mark of 186.73mph was set in the May, 1996 event by veteran open road participant, Kelly Seivers. Again in 1999 the course was remeasured by an independent civil engineering firm and found to still be about 2,000 feet short, and so that record was retired and the new Public Highway Land Speed Record was established after moving the Start Line to bring the course to exactly 90 miles in length. The year 2001 was a year of big developments in the SSCC history. We were accepted into the Guinness World Book of Records for two records, Highest Speed On A Public Highway and the Fastest Road Rally. The organization’s many dedicated volunteers work hand-in-hand with the State of Nevada to boost travel and tourism in the region. Upcoming events will host the world’s top open-road drivers, names like Chuck Shafer, Rick Doria, Kim Baker, Todd Carpenter, Dave Golder and Tarik Ben Jabar, as they go for broke in their attempt to set new Public Highway Land Speed Records. One thing’s for sure, in the words of Phil Henry; “We can count on these guys to come out with the fastest machines to ever set rubber on a public highway”. 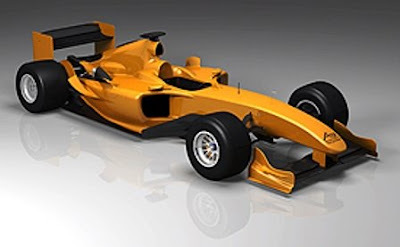 The world of open-wheel racing is expected to have a new platform on which to base the next generation of a racing series starting sometime around September 2008. 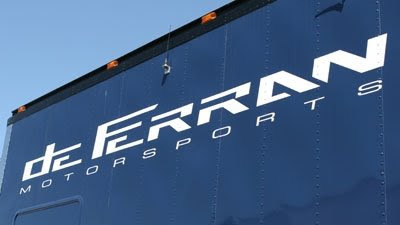 The new chassis and engine combination was designed by Farrari for the international team racing series, A1GP World Cup of Motorsport, and will have its first shakedown run later this week. The 600bhp V8 is due to be given its first shakedown, by former grand prix driver, and A1GP commentator, John Watson on Friday, May 16, 2008. A1GP is the first opportunity in any area of motorsport for nations to compete on a level playing field. It is a series where technology and innovation are deliberately equalized, making success dependent on human bravery and pure driving skill. Team and driver combine to create a performance advantage and the winning nation raises its flag in celebration. A1GP is more than just another motorsport phenomenon; it's an entirely new concept. Pitting driver against driver and country against country for the first time in history, A1GP brings together 22 nations, representing 80 per cent of the world's population, to compete as equals, without financial or technological advantage. A1GP have revealed the first image of the new Ferrari-designed car. The chassis is based on the F1 world championship-winning Ferrari F2004, but incorporates features intended to to allow overtaking and close racing, as with the previous A1GP car. 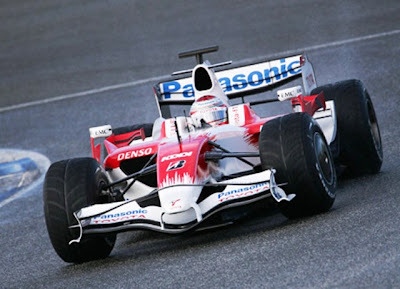 The design of the chassis was overseen by Rory Byrne, who designed the F2004, and A1GP technical director John Travis. A1GP chairman Tony Teixeira has been pleased by the progress of development with the new car, and hopes to unveil the new machine in the coming weeks. "Everyone is very excited abut this project and it will be fantastic to see the new A1GP Ferrari turn a wheel for the first time," he said. "We obviously still have a lot of work to do as this is just the first step in what will be an intense development and testing programme, but I'm very happy with the progress made so far. We're lucky to be able to use some well-known motor racing companies for certain areas of expertise. "I'm pleased to say we're on schedule and we'll be announcing the date of the official unveiling of the car soon." Go figure ... The Panoz DP01 has plenty of chassis available for teams to race at 750+bhp since the unification of AOWR ... even though the Panoz does not have the name cachet of Farrari, wouldn't this be a better option? Within their first four to eleven laps, just after the 10:00am PDT start time of the official first day of Practice at Indy, the seasoned drivers who have been to the track and have raced in IndyCar Series for the last few years showed their stuff. 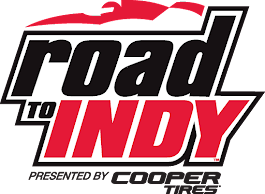 Tony Kanaan – 224.591 – 9 laps, Danica Patrick – 223.479 – 11 laps, Ryan Briscoe – 223.068 – 8 laps, Marco Andretti – 223.041 – 4 laps, Helio Castroneves – 222.893 – 7 laps ... all speed marks above the fastest mark set by the ChampCar transition team rookies with KV Racing Technology's Will Power at 222.267 after 154 laps of practice. Two other rookies also posted better times than Power in the Rookie Orientation Program with Rahal Letterman Racing's Alex Lloyd - 223.033 after 106 laps and Andretti Green Racing's Hideki Mutoh - 222.600 after only 78 laps. The biggest story from yesterday comes from Andretti Green Racing driver, nineteen year old Marco Andretti posting a lap speed average of 226.599 mph. 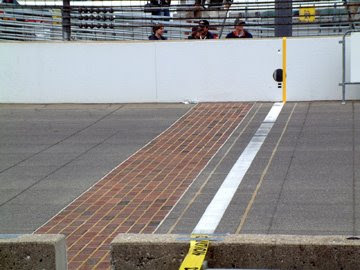 This mark bests the 2007 pole qualifying speed set by Team Penske driver Helio Castroneves at 225.817 by nearly 8/10ths of a second. The regulars showed their collective experience by topping the speed charts with occupying the top ten lap speeds posted. Will Power was able to improve his time and lock down eleventh at 223.550 mph. 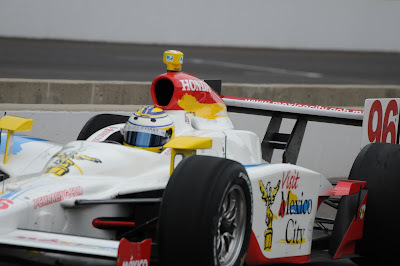 Mario Dominguez showed how difficult it is to get to speed on a new track, especially one as unique as Indy. Day before yesterday on Day 2 of the Rookie Orientation Program, he progressively advanced his times on each lap - 142mph, 171mph, 189mph, 194mph, 199mph, 201.518mph, 204.435mph, 204.777mph – lap 13, 205.024 – lap 17, 205.828, and so on. He finally posted a 214.358 and completed 48 laps on his first day, Monday. Yesterday, he began to achieve more speed - Mario on the day: “Today we really spent the afternoon building up speed and finding the limits, step by step. Every lap I turn, I learn something. Yesterday we had to get out there and pass our three phases so we didn’t have time to really focus on anything but that. So today was our first day finding limits and seeing what the car needs. We are fighting a loose condition, but we are working through it. He has completed 61 Laps and is at 30th on the speed charts at 218.306. 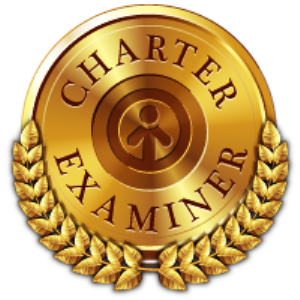 At the EDJE, we believe that PCM will be able to figure out the set-ups because they really are one of the more competent truly new teams out there. Today, the fourth day of trials and the third day Mario and the guys at PCM take to the track, the racers face the prospect of a 60% chance of rain. Rain expects to be a threat to practice sessions over the next two days.